You probably know that Microsoft is limiting what is being displayed on Windows 8's start screen in several ways. The screen resolution of the system determines the number of rows and columns that are displayed at the same time on the screen. While the company did implement an option to modify the number of rows to a certain degree, it did not integrate options to go beyond the hard coded limits determined by the screen resolution. To put this in perspective: if you are running a resolution of 1900x1080, you can use a maximum of six rows per column for start screen items, the same that 1440x900 resolution users get. It is not really clear why Microsoft is limiting the number of items that you can display here, but it is likely that it is design related. If you ask me, I'd like to see options to switch to a text mode listing instead. I do not really like the tile display at all for a number of reasons. I think it is too colorful for instance, do not use the live tile functionality, and prefer speed over style anyway in most situations. So what can you do if you want to display more rows on your screen that possible? That's were the free Metro Scaler software comes into play. It basically sets the screen resolution for the start screen area of Windows 8 - including the log in screen but excluding the desktop - to a resolution you can pick freely using a slider it makes available. Just set the new display resolution that you want to scale the start screen interface to. You see a preview of how the rows and columns will look like when you do so. Please note that you need to restart - not turn off and on again - the PC for the new scaling to show up on the start screen. I bought a new desktop computer with windows 8 on it. I can’t find ANY advantage with windows 8! I shall buy a windows 7 Ultimate and download it on the new computer. Do you think Mr. Brinkmann that Windows 8 is just a new business idea, or do you KNOW it has any advantage against Windows 7 ??? Well it features new security features that other Windows systems do not offer. What Security Features> Martin? The same old out of date Firewall? Windows Defender? Microsoft states that they installed their own Anti Virus, but I don’t see any traces of it! They sure didn’t install Windows Live Security, the one that failed every Security test thrown at it and got mediocre reviews!! Most people will install a good third party AV or Security Suite, such as BitDefender or Kaspersky, so if the security features are the Only reason to update to Win8, people might as well stick with Win7, as the Metro style Start Screen seems redundant and obstructive, if nothing else! Might be O.K. on any Touch Screen device, but otherwise totally useless on other non-touch devices! Fort users who “prefer” the new Start Screen, Metro Scaler could come in handy for them! can you guys confirm that upscaling work? most of the ones I tried only work when downscaling. I can’t confirm. Was only able to try from 1920×1080 to 25″ and that did not change the display at all. I see from your answer, that my decision is right! I am changing back to Windows 7 Ultimate. I can’t find “the new security features”! Sounds useful, but has no effect whatever. I tried it at a variety of settings and it affects my Win8 laptop screen not at all. This can make Windows think the monitor is smaller, so less tiles show. But you can’t get more rows of tiles to show beyond a certain hardcoded limit put by MS for each resolution. You pointed out the one main thing I can’t get past with tiles. When used for things that have dates/size/attributes/etc… you can’t run down the list and compare them instantly, your eyes need to keep jumping to the next box and finding the information all over again. It makes sorting damn near impossible. This would be pretty useful indeed! Thanks for the tip. While I love the design of Windows 8 because of its user friendliness to mobile devices, I do agree that it just makes it really hard to use productivity programs such as Word and Excel. Unless, somebody comes up with a better way to display Excel and Word on Windows 8, I think I cannot upgrade to it on my desktop. Hopefully, Microsoft will! 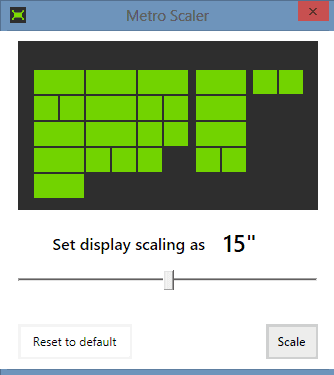 I’ve tried MetroScaler on the Windows 8.1 preview to down-scale my start screen to show only 3 rows. Unfortunately, it doesn’t do anything. The screen stays just like it was before. Guess we will have to wait for an update before it becomes compatible again. With new sizes, Microsoft has probably changed the way this is handled. The Metro Scaler no longer works as it originally did. Regardless of the sliders variable 3″-24″ settings, it only has 3 settings now: small, medium, and large. (6″, 12″ and 24″) and sadly there is no update on their site other than the February 2013 release.